Forget wing-back, Matt Doherty might be the solution to the Republic of Ireland's problems up front. Doherty is enjoying the season of his life for Wolves and while right-backs tend not to be judged by their goal return, the Irishman's habit of finding the net is doing his reputation no harm whatsoever. 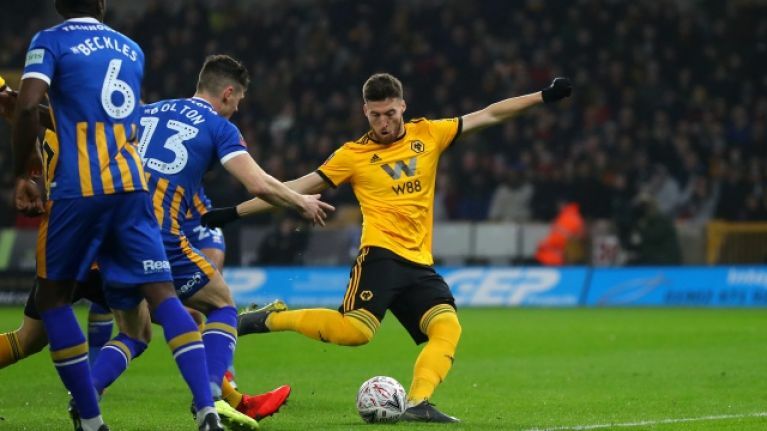 After sparing Wolves’ blushes by forcing a replay against Shrewsbury Town last week by popping up in the box and rescuing a draw for the Premier League side, Doherty opened up the scoring at Molineux on Tuesday night. It was the perfect start for Nuno Espirito Santo’s men but Shrewsbury fired straight back and looked destined to go into the break 2-1 up. That was when Doherty did what Doherty usually does nowadays as he restored parity with a header on the stroke of half-time. That’s six goals in all competitions this season for the 27-year-old, who will likely attract interest from a host of clubs this summer. Doherty kindly allowed a teammate to get on the scoresheet in the second half, but the Irishman did treat himself to an assist when he set up Ivan Caveleiro for Wolves’ third and decisive goal. Next up for Wolves in the FA Cup is a trip to Ashton Gate, where they will meet Bristol City on the weekend of 15-18 February.